EHF volunteers found Dilbert suffering from fish poisoning and dragging his painful, paralysed hind-leg as he scavenged for scraps of food. His leg was severely bruised and his tummy suffered deep wounds from being dragged across rough ground for an unknown period of time. It took this darling dog several weeks to recover from the toxins, and a few more for his stomach to heal. But with treatment, love and patience from EHF’s volunteer veterinary team, Dilbert managed to make a full recovery. Long-time Esther Honey supporters Cameron and Dorothy Robertson adopted Dilbert, renaming him Max in January. He’s getting along with the Robertson’s other dogs fantastically and enjoys chasing chickens (not catching!) through the Taro and swimming in the sea. Now eating four times a day, he’s looking wonderfully healthy. 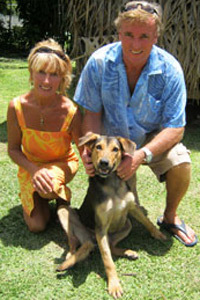 Thank you Dorothy and Cameron for helping to provide homes and desperately needed veterinary care for island animals like Max! 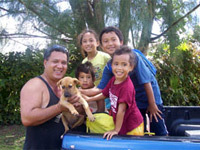 A photo of Scooby going home with his loving family. Rex was a tough case. “He is probably 12 or 13 years old and has had a rough life.” wrote Alanna, a recent volunteer. 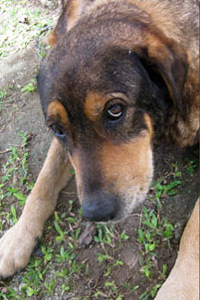 “He came in as a stray who had been hanging around one of the schools prompting a parent to call Esther Honey to ask us to collect him.” A fungal skin infection made Rex smell very bad and it was clear that he was also suffering from arthritis. Once at the clinic, the crack Esther Honey team went into action to give this senior Raro dog the medical attention and safe harbor he deserves. Given his advanced age and health limitations, however, Rex’s outlook for placement looked glum. “But you wouldn’t believe what happened today,” wrote Alanna. It is clear that Rex could not be in kinder hands.